Sept. 9 saw thousands of incarcerated men and women go on strike to take a stand against civil and environmental injustice in their respective prisons. The multi-state strike was organized both inside and outside of the prisons. Some unions have begun addressing the twin issues of racial justice and economic justice with all their members. These discussions have moved from mere individual solutions to the need to end “institutional racism.” There is no clearer example of institutional racism than the prison system. Michelle Alexander, in her book “The New Jim Crow,” wrote, “I came to see that mass incarceration in the United States had emerged as a stunningly comprehensive and well-disguised system of racialized social control that functions in a manner strikingly similar to Jim Crow. No other country in the world imprisons so many of its racial or ethnic minorities as the U.S.” Since the beginning of the so-called drug war in 1982, the U.S. penal population exploded from 300,000 to more than two million in less than 30 years. The National Prison Strike calls attention to the 13th Amendment of the Constitution—generally believed to have ended slavery in 1865. But there was a loophole, which says, “except as a punishment for crime whereof the party shall have been duly convicted.” It was a common practice in 1865 for plantation owners to lease Black convicts out of the prisons to work their fields, and today prisons are a multi-billion-dollar industry. Some states do allow prisoners to be paid, but it is always under $1 an hour, and in most states they are paid nothing. In federal prisons, half of the wages are withheld for “room and board.” The prisoners have to use whatever remains to pay for necessary items that must be purchased from the prison, such as toilet paper, deodorant, menstrual products, and laundry detergent. Ray, who is being held in St. Clair Correctional Facility in Springville, Ala., explains why he has been organizing the strike: “The businesses involved understand that this is an operation of slavery and everyone is exploiting the free labor out of the prisons.” Ray believes that every action will spread work stoppages to more prisons, incrementally slowing down the profit motive that drives the prison system. 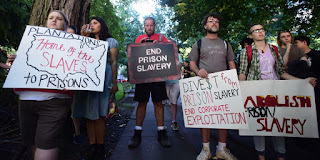 They are also striking to address conditions within the prison and publicize toxic work conditions, extreme heat, insufficient access to health care, and contaminated drinking and bathing water. For example, in Texas this summer there were an unreleased number of deaths in state prisons as internal temperatures reached 140 degrees on some days. Only 30 of 109 Texas State prisons have air conditioning. There have been cases of heat stroke, extreme dehydration and other heat related conditions. The state of Texas houses 146,000 inmates and are in the middle of a lawsuit alleging “deadly heat” in their facilities. There are also prisoners who are working unpaid in the Texas Correctional Institution (TCI) Chemical Plant without air ventilated safety masks. Whenever an auditor or inspector is at the gate a warning system goes off to shut down all activities that have been deemed illegal or hazardous by the fire marshal. The number of facilities in the South participating in strike activities continues to expand. Prisoners in multiple Alabama prisons, at least two others in Florida, Fluvanna Women’s Prison in Virginia, and prisoners in North and South Carolina have organized strikes. Most prisoners in Georgia do not work on Fridays but they planned to join actions on Sept. 12. Reports from other areas of the country include 400 prisoners in Kinross Correctional Facility in Michigan, who held a protest in the prison yard and caused property damage resulting in 150 prisoners being transferred to other facilities. Clallam Bay Correctional Center in Washington State is in lockdown after actions there. Many women prisoners refused to work, went on hunger strikes and/or led uprisings in Central California—including the county jail in Merced, Calif.—Kansas, and Lincoln, Neb. An important part of the strike was to show visible solidarity outside the prison. There were support and solidarity actions in 15 major cities, and dozens of smaller cities and towns around the country. This was an attempt to shine a light on the inherent racism of mass incarceration and also reveal the hidden facts surrounding huge profits being made from free labor. The informational picket in front of the Benton County Courthouse included students from Oregon State University and the organization Allied Students For Another Politics (ASAP!). They had done their research and found that the demands of the strikers hit close to home. One of them had a sign that said prison labor had been used to build the OSU solar farm, a green energy project. Prisoners were paid 93 cents an hour to assemble solar panels for the project. A subtractor for Elon Musk’s highly subsidized solar energy company used the prison labor to keep costs down on the green campus project. The strikes will continue inside the prisons, and the information about the use of slave labor will continue to spread in communities large and small around the country. >> The article above was written by Ann Montague, and is reprinted from Socialist Action newspaper.